Like lots of other simple foods, Mashed Potatoes are just about 100% ingredient selection, quality and technique. There aren’t any other flavors to cover-up shortcomings. A little care and patience will reward you with mashed potatoes that would be at home in a four-star restaurant. This recipe produces a big bowl of amazing, warm, fluffy, buttery mashed potatoes and will easily feed 8 hungry people. Note that I specify Russet Potatoes. Other potatoes may work, but different varieties have different starch levels and may produce dense, gluey potatoes, which is not what I was looking for. 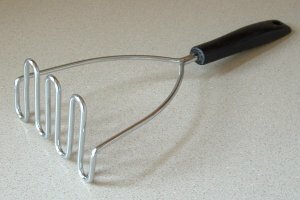 The above masher is critical to the success of this recipe. It mashes the potatoes beautifully without damaging them enough to release more starch than we want, and leaves a few small lumps that give the potatoes a beautiful texture. Peel potatoes, cut into chunks (approximately one inch cubes). The exact size isn’t critical, but they should be mostly uniform. If the sizes are wildly different, some will be cooked and start to dissolve before the others are finished cooking. Carefully inspect the chunks after cutting and remove any brown, green or otherwise discolored spots, including any streaks that run through the potatoes. Fill a large pot half way with cold water and add 3 or 4 tablespoons of salt. Taste the water. It should taste salty. Add the potatoes, cover and cook on high until the water boils, then reduce to medium and cook until a fork pierces a chunk very easily. Gently mash with the masher (picture above) a little bit until just broken up. Add all the butter and gently fold with a wooden spoon. Add about half the milk and gently fold with a wooden spoon. Mash a little more only if still too lumpy. If still dry, gently fold in more milk with a wooden spoon, working them as little as possible.